Beverly Hills is Ideally tucked between Southern California’s cool ocean beaches and sunny mountain foothills, Beverly Hills lies along the northwestern edge of Los Angeles. You’ll find it’s extremely convenient to downtown Los Angeles, the L.A. Convention Center, Los Angeles International Airport, Century City, and most other major sites in the region. Avoid costly mistakes. Use our vacation planner so we can match you with our most suitable Virtuoso, California Travel Advisor. Get free upgrades, unbeatable airfare, special touches and luxury amenities. In Beverly Hills you are also just a few minutes drive from the Pacific Ocean and less than an hour from virtually every visitor attraction in Southern California including Hollywood, UCLA, the Getty Center, Disneyland and Universal Studios Hollywood. The style of Beverly Hills is casually elegant. Jeans and sportswear are the general rule by day. In the evening, dressier attire is more appropriate in some hotels, and some restaurants prefer jackets and ties for men. During fall and winter in particular, visitors will find dressing in layers, including sweaters or light jackets, the most comfortable strategy at night. Take a trolley tour, explore the City’s public art or browse a bevy of chic boutiques: there’s something to delight every interest in Beverly Hills. A world renowned destination for thousands of visitors each year, Beverly Hills features internationally acclaimed restaurants, grand, luxury hotels and unparalleled shopping. 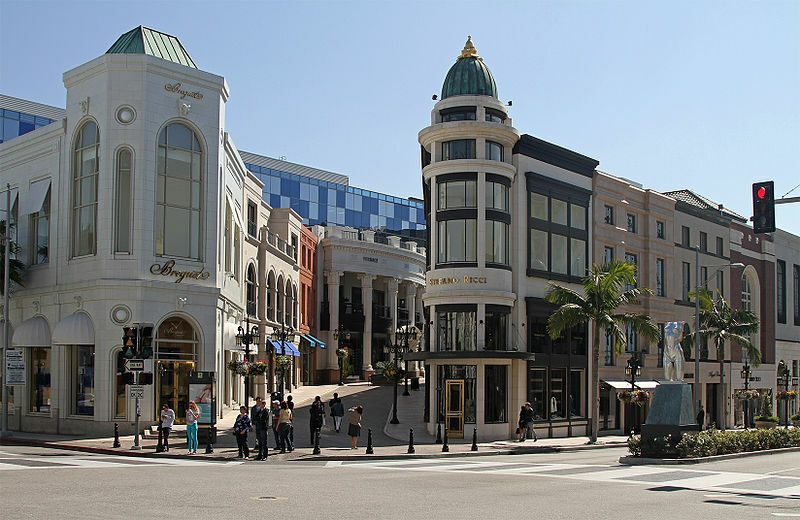 Rodeo Drive in Beverly Hills is renowned as the epicenter of glitzy shopping and luxury fashions. The Redeo Drive store span three blocks, with more that 100 world famous shops and restaurants.